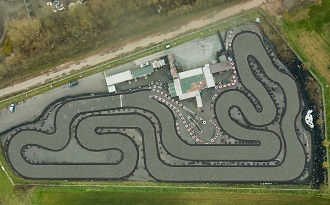 Midland Karting has two tracks on site that offer a challenge for all drivers of all abilities. With grippy ex-airfield tarmac there are plenty of overtaking places and both of our circuits are open all year round. The venue is also floodlit so it is the perfect choice for after-work events or, for the hardy, late afternoon races in the winter! Head southeast on Swan Road and at the roundabout take the first exit on to The Friary. Turn right on to St. John Street, turn left onto Birmingham Road/A51/A5127 and continue to follow A5127. Go through two roundabouts, merge onto A38 via the ramp to Burton and then bear slight left on to Wood End Lane. Turn left to stay on Wood End Lane and go through two roundabouts - Destination will be on the left. 15-minutes qualifying to determine your grid position then a non-stop 90-minute team relay race. 5 practice laps, 6 race heats of 6 laps plus quarter finals comprising 6 laps, followed by 8 laps semi-finals and a Final of 10 laps for the tops scoring drivers. One hour's exclusive use of the circuit with four karts for between 4 - 12 cadets driving single-engine go-Karts. There are conference facilities for 24.